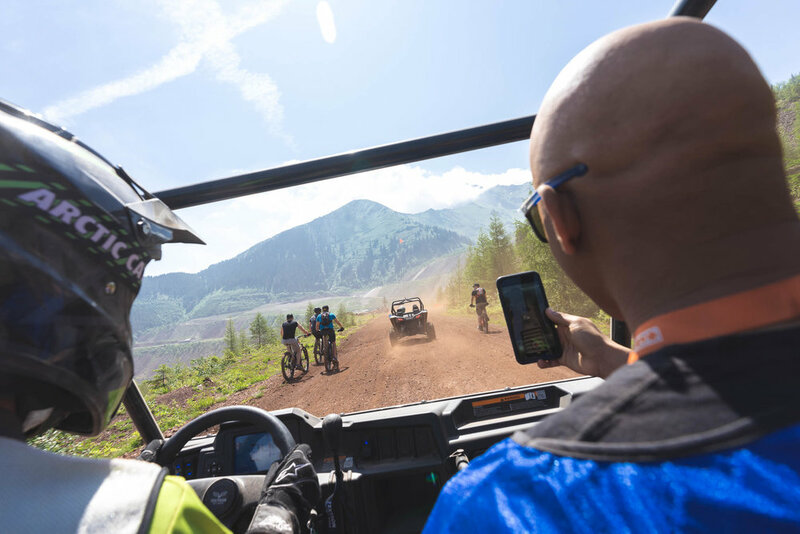 Why sign up for the most grueling enduro race ever conceived? 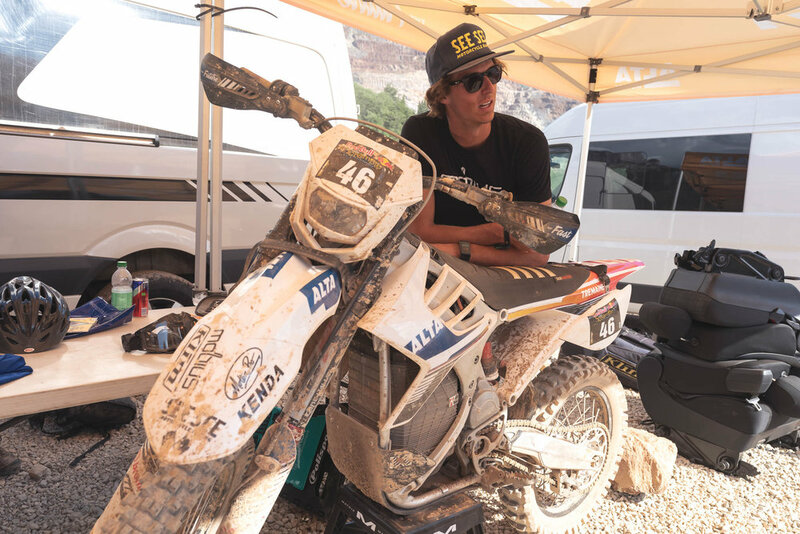 Why travel half-way around the world to compete with electric motorcycles that had never before even attempted a hard enduro? Why did we only send 4 bikes? Those are all great questions and there's only one answer for it. 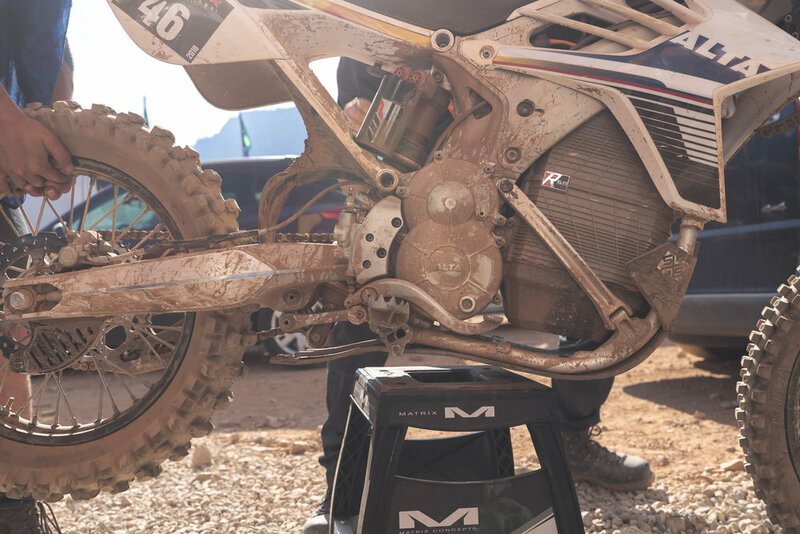 We believe in what we make here at Alta Motors. 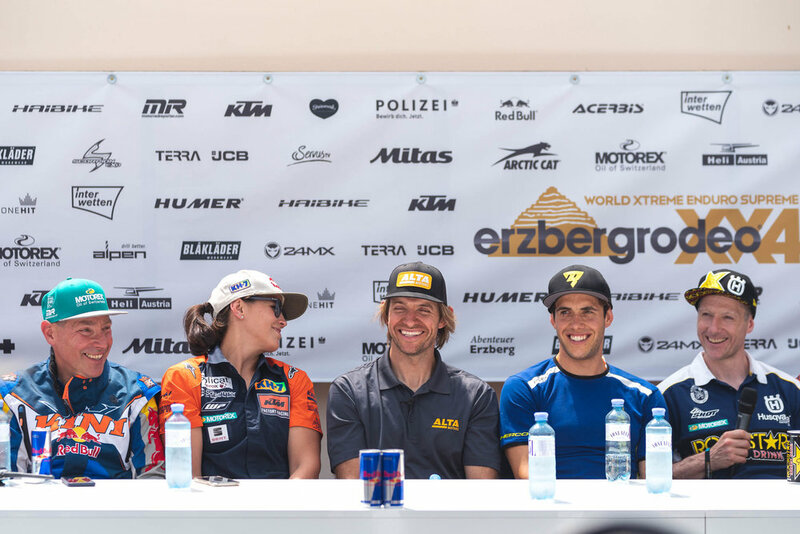 We created an electric motorcycle – one that can compete at the highest levels of the sport, and the Erzbergrodeo Red Bull Hare Scramble would be the ultimate testing grounds. Unfortunately for us, fate had other plans. 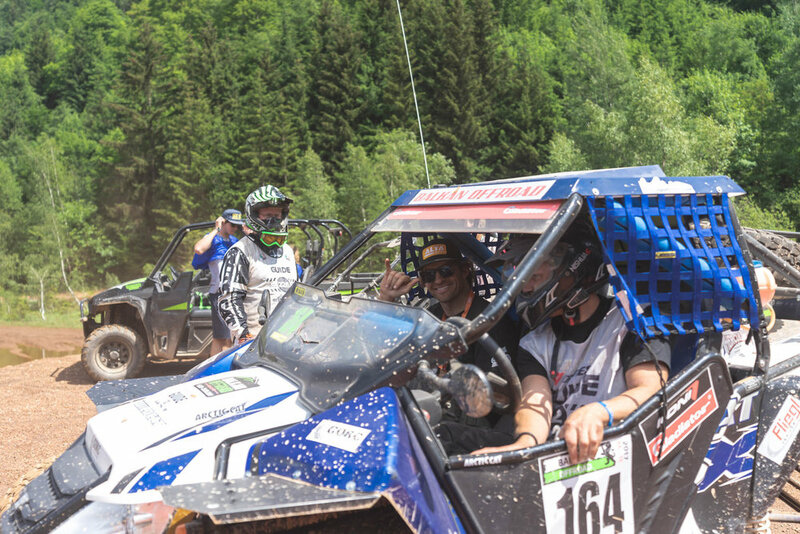 After just a few months of training and preparation, our UK based off-road-machine Lyndon Poskitt set out for an 11 hour drive across half of Europe to Austria. With his two prototype Redshifts(later released as the Redshift EXR), generators, and race gear in tow, the Poskitt crew takes a lunch pit stop just outside of Harlow. The culprits made off with both bikes and a majority of Lyndon's race equipment. Media outlets across the globe picked up Lyndon's pleas for aid, collecting over a million views in a matter of hours. Rewards were offered, APBs put out, but to no avail. Alternative plans were hatched to drive in the wrong direction to France to pick up some stock Redshift MXs from a gracious owner, but the detour would have forced Lyndon to miss qualifiers. To the dismay of our crew in California, we received the news as we were leaving for the airport. What had we gotten ourselves into? See those tiny multi-colored pixels to the left – those are cars. 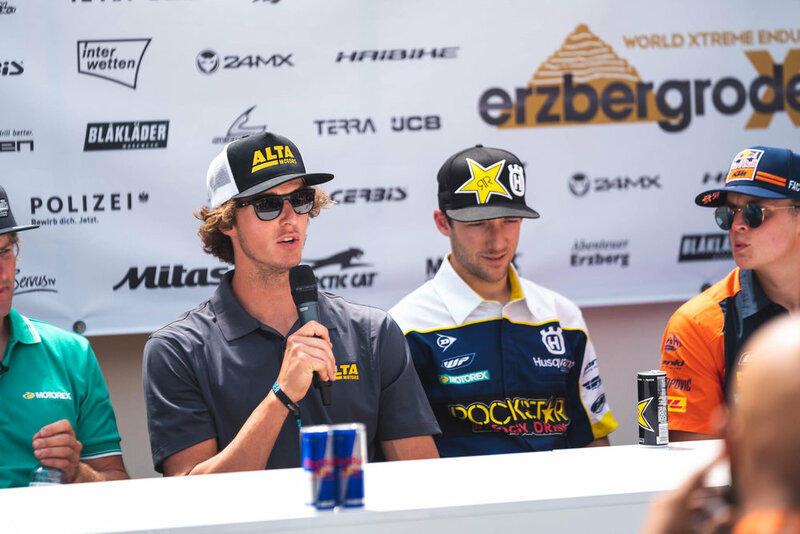 Enter – Ty Tremaine, the Alta factory pilot. 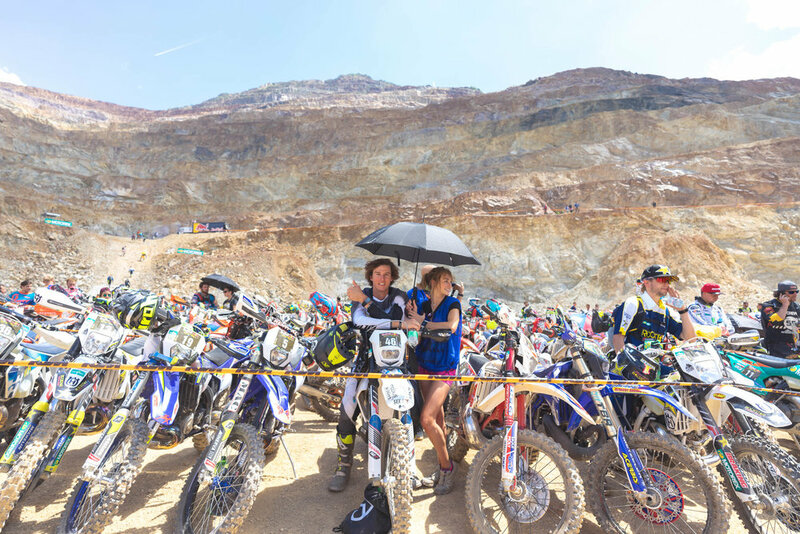 Probably the tallest hard enduro rider ever. Able to put his feet on the ground while sitting on his bike... with his bike on the stand. The Manute Bol of the enduro scene. Ty had arrived a day earlier than the rest of the Alta crew and toured the Iron Mountain, hiking 10 miles through the course. Fortunately for the rest of us and all of our gear, we had 4x4s. 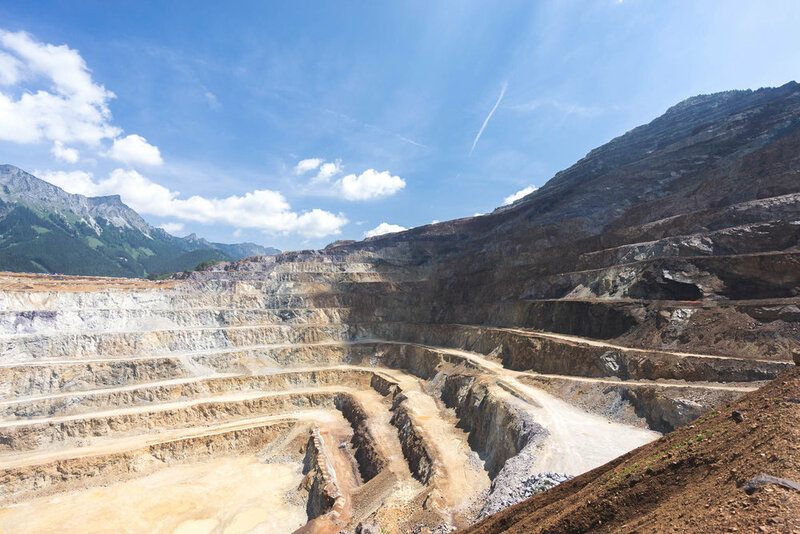 I don't know how many iron mines you've seen in your life, but it's safe to say they're pretty big, Erzberg being the largest open-pit mine in Western Europe. 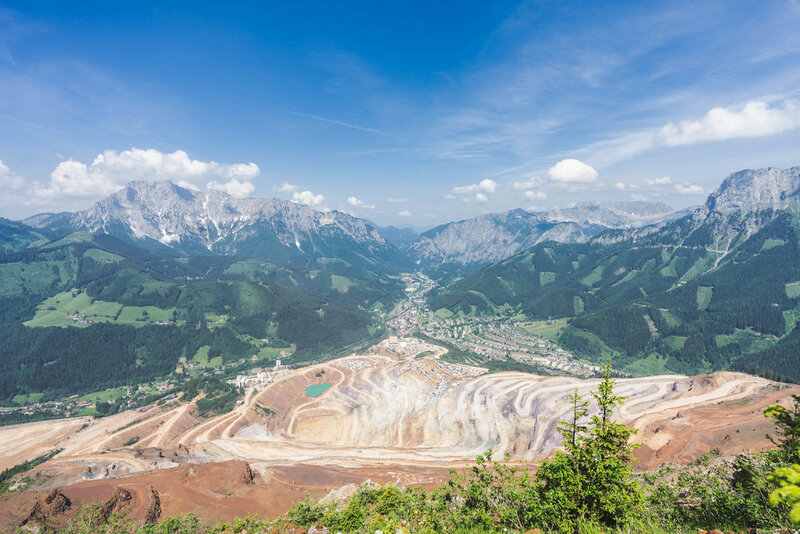 Covered in a thick coating of a red-orange dust, we took in the beauty of Austria, atleast the giant iron mine part of it. With the official route still unreleased we hit all the known features we could. With ominous names such as Elevator, Machine, Dynamite, and Carl's Dinner, we soon realized that the photo and video we had seen could never do these sites justice. We reached the top in time for a selfie, the air cool was cool and thin, our heads still spinning from the switchbacks it took to get up there and the daunting task we set ourselves up for. Friday, Qualifying Round 1 - The Prologue is a 13.5km(8.5 miles for us Yanks) dead sprint to the top of the mountain. Released at 20 second intervals between each other, the Prologue would see just north of 1,500 racers from all over Europe and the world try to qualify in the top 500 to be able to even attempt the main event. 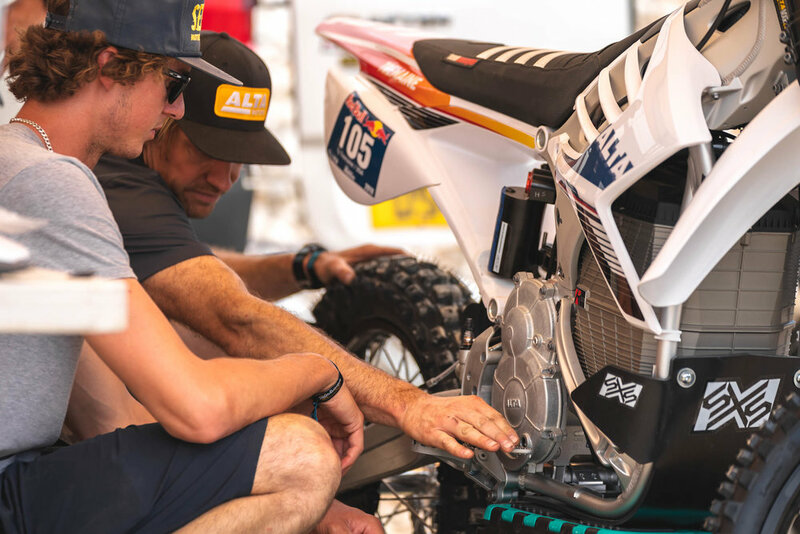 Despite the major setback of losing Lyndon's bikes, generators, and most of his gear, the Alta crew stayed the course and fielded both riders in the Prologue by dividing up the two remaining bikes originally set up for Ty Tremaine. Friday morning, Alta’s first run in the Prologue unsurprisingly proved to be a learning experience for the team. We geared too tall and the long climb to the top brought some overheating which limited Ty and Lyndon's top speeds. Despite these problems, Ty managed to take 43rd, faster than 1,457 other riders. Lyndon just missing the second row, placing 101st. 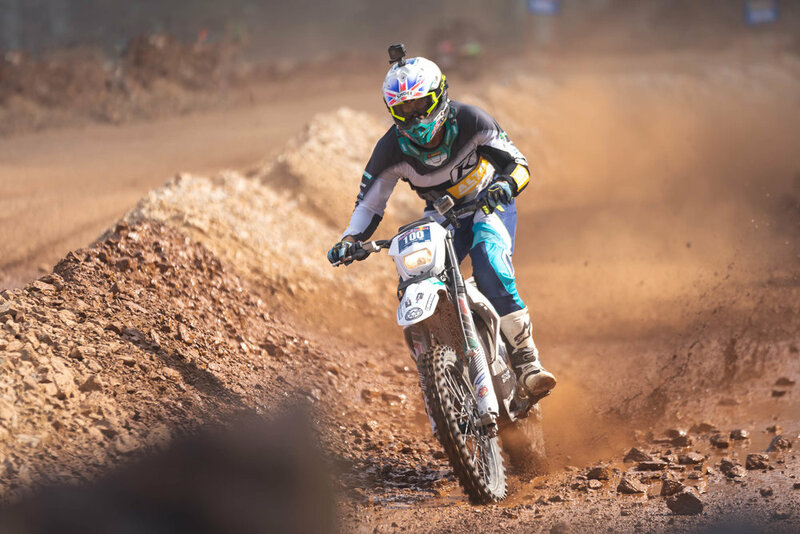 Saturday, Qualifying Round 2 - With a handful of tweaks to gearing, suspension, and the bikes' tunable performance maps, Ty and Lyndon set out on their second Qualifying round. The track now worn down and loose by 1,500 riders mashing their throttles to the stops. The tweaks to the bikes proved fruitful though, with Ty finishing 35th fastest for the day and moving up a few spots overall, firmly positioning him on the front row for Sunday's big event. Lyndon jumps a respectable 11 positions to seat himself in the second row. 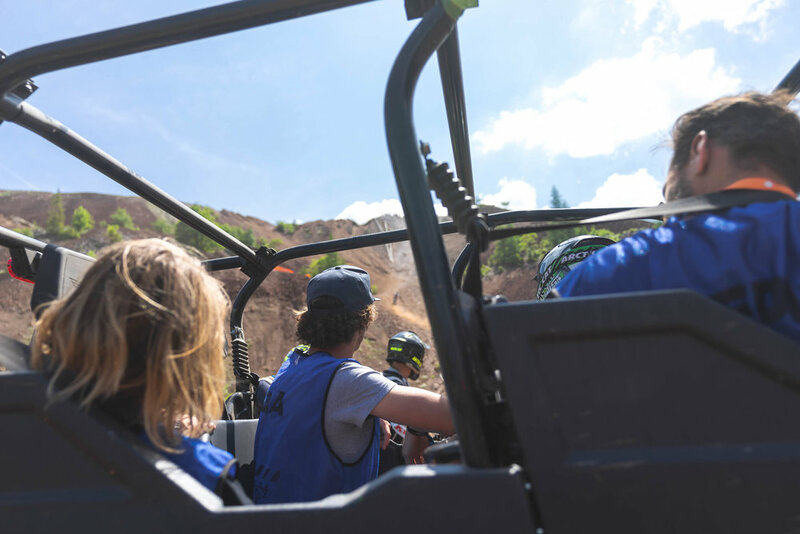 Unfortunately high-tech batteries were in short supply at Erzberg with half of our fleet stolen, and Ty needed both of the remaining units to have a shot at finishing the course – one that burns upwards of 12 liters(over 3 gallons) on gasoline bikes. Lyndon's indomitable spirit shrugged it off, happy to support Ty with valuable course intel and an extra set of mechanics hands. 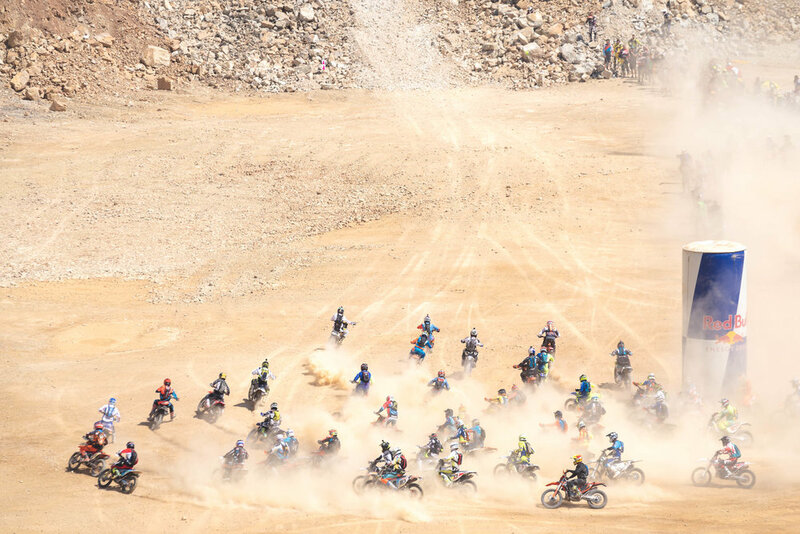 Sunday, Race Day – Ty made his descent into the pit cutout from the side of the mountain, a gigantic swimming pool of rock and dust several football fields wide. Hours passed slowly, as 500 riders collected into the dust bowl, some respite from the sun was needed, and shade was now at a premium. 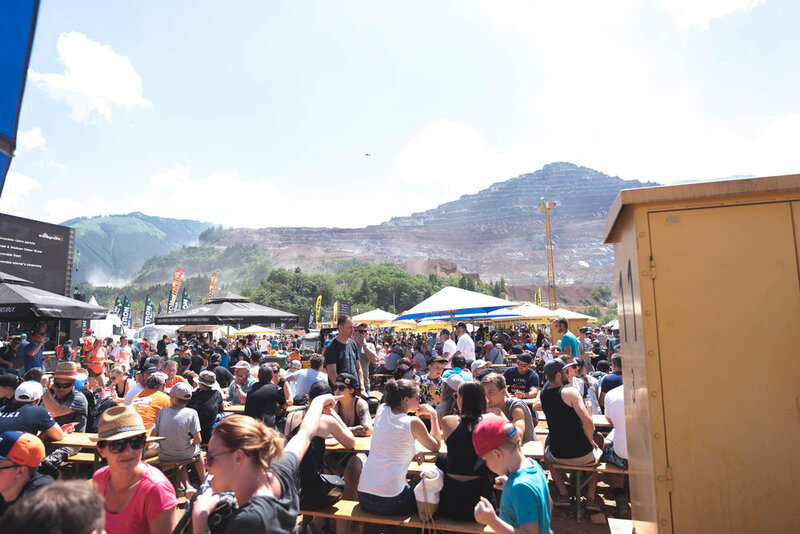 Red Bull keeps us entertained with stunt riders and skydivers, but we were not there for that, we were there to race. With engines still revving, the flag is brought out, bikes are warm, the flag dropped – apparently this was not a dead engine start, a first in Rodeo history. Caught off guard, Ty got a late start off the line and initially trailed much of the first group. 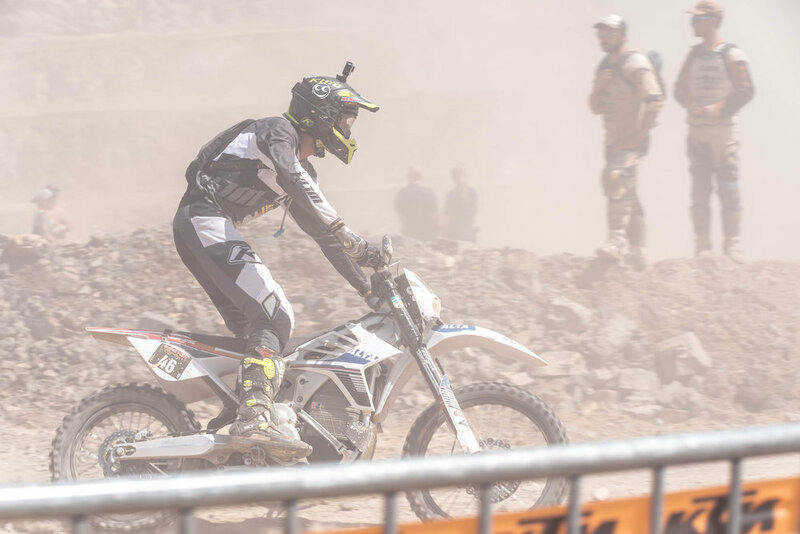 But Ty quickly gained ground by picking his lines out of the mine and dicing his way through riders struggling up the brutal hill climbs, gaining a spot amongst the top 20 as they rode up the Mitas Rocket Ride. Checkpoint after checkpoint, Ty moved up. The hillclimbs were gnarly, the forest is treacherous; the Iron Mountain lived up to its reputation. Watch Ty Tremaine's GoPro footage for an intimate experience of Erzberg; because nothing we can say will do it justice. Unfortunately for us, without any way to obtain course data prior to just running the race, we underestimated the mountain, placing our battery swap location just out of reach. Ty was one checkpoint away... but hey, that's racing. You won this time Erzberg, but we'll be back. Heck yeah, sign me up for the newsletter!